We got pretty close during the Encore! Erin and Jannell singing their hearts out!! We got there a little early and had a great time tailgating in the parking lot with beer and sandwiches! Walking into the concert we ran in to our friend Jennie Lewis who had just moved to ATL from DC a few weeks ago! We were so excited...we all started screaming...it was just all too random! It was a crazy night but SO much fun! 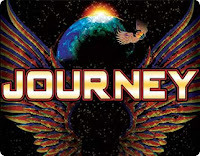 The music was great, and their new lead singer (an Asian guy they found on You Tube) was the best Steve Perry since...well... Steve Perry!! !